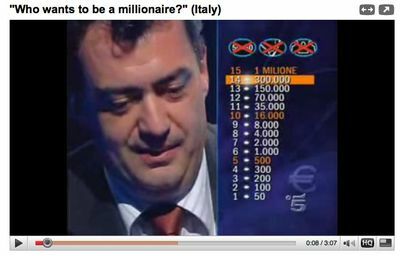 Had an interesting meeting with an instructor of world media who pointed out that the popular game show Who Wants to be a Millionaire has been exported around the world, often with the same set design, background music, text fonts, graphics and lifelines. You can check YouTube to see for yourself. So the challenge would be...what differences are there left? 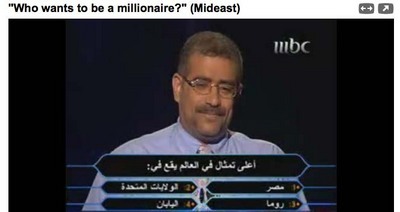 Well in the case of Arabic, the right aligned (RTL) text is one one. 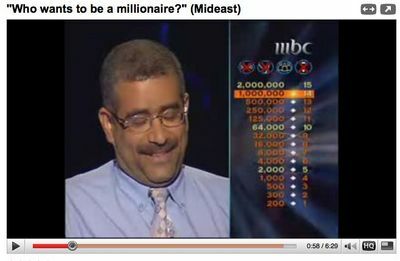 Not only are the answers in the distinctive WWTBAM angular slots right aligned, but the choices are layed out with #1 choice set in the upper right box, not the upper left as in the U.S.
Interestingly, even the prize level numbering is reversed with the values (apparently in Saudi ri(y)als) on the left and the 15 prize levels on the right. Compare with the LTR Italian version with the prize levels on the left and the monetary values (in euros €).